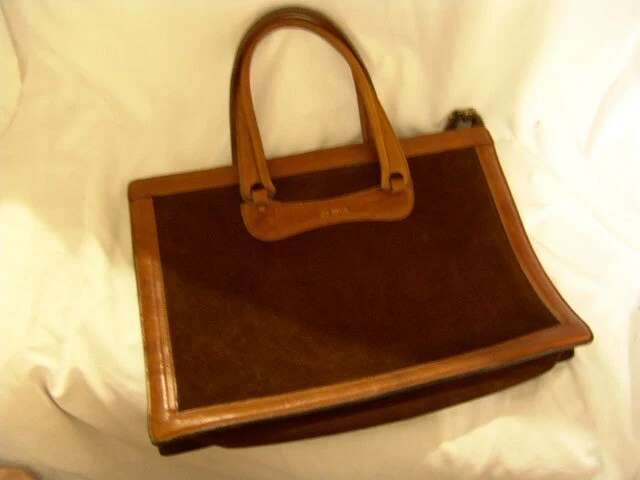 I went out to dinner with a friend this weekend who had the cutest vintage coach handbag that could perfectly fit an 8.5 x 11 without screaming “I’m on my way to an interview!! !” and went great with her hipster bar/dinner look. 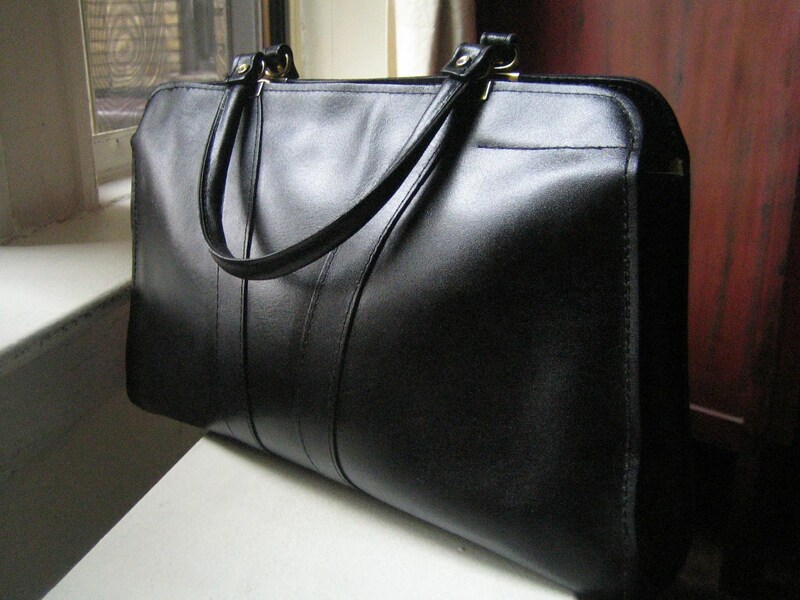 I am all about having multi-functional pieces and must admit, this is one of the staples I am missing, a day bag that doubles as a briefcase. I hate the looks of an actual brief case as much as carrying an almost big enough bag with papers sticking out the top. 14″x21″ Easy to slide in an 8.5″ x 11″ binder with room to spare. 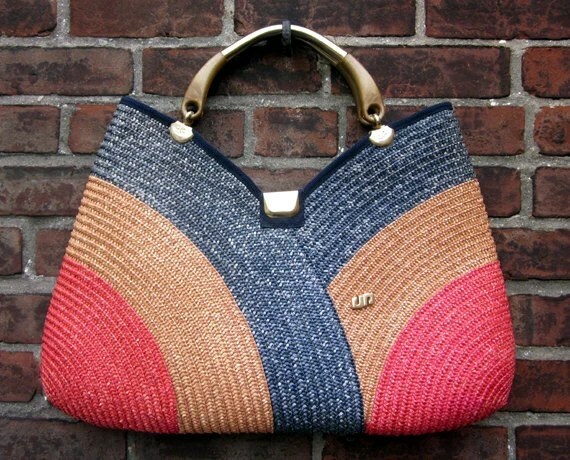 Gorgeous bag 9.5″ x 11.5″. Interior departments designed to slip your paper work. What’s your interview to going out secret? You don’t have to go to great lengths to funk up your holiday look. Just add some length. 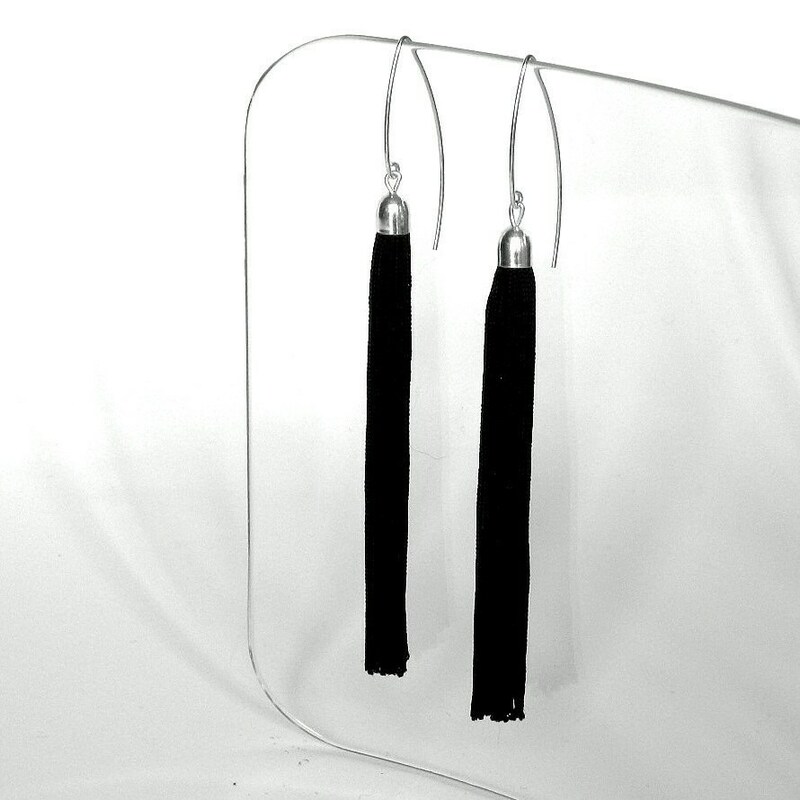 Super long earrings are perfect with that little black dress as an edgy little touch. Go ahead, add some length to your look and have a very Funky Friday! As promised in Uping Your Etsy Part 1:Using Your Tags, here is another way to gain views/sales on Etsy. When I first started Frequency Vintage a little over a month ago I was only offering shipping from US to US. I thought shipping international would be way to expensive. WRONG! You can use a flat rate box and it will ship to Canada , Mexico or anywhere else for $13.95 or less! As long as the package is under 4 lbs, the cost aint that bad. 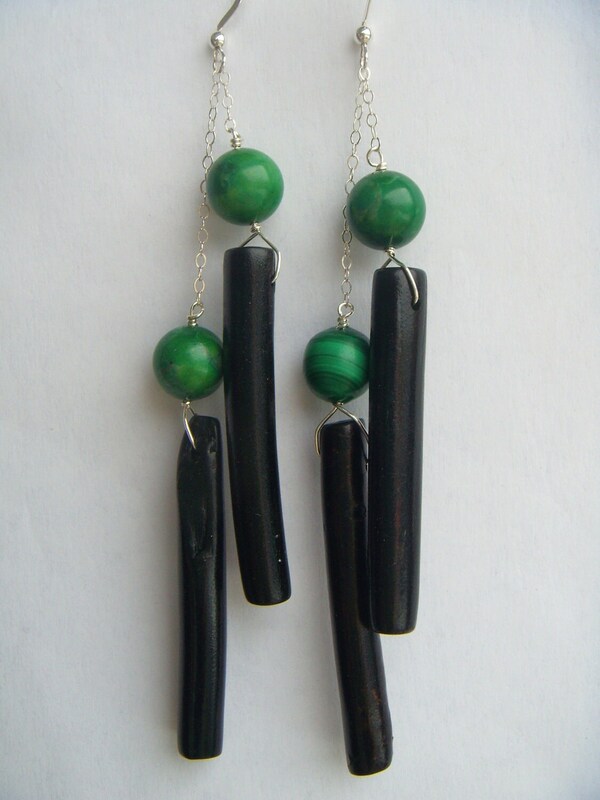 This is perfect for a dress or belt, even a pair of shoes. Plus packaging is easy. So I went ahead and adjusted all my items to reflect that, yes, Frequency Vintage does ship internationally for $13.95. And voila! Sold a belt to a stylish gal in Australia that same day. Success! Wondering what your packages will ship for? I found this to be a great resource to help figure out postage for the different USPS zones. Just fill in your package info and get shipping times and rate: http://ircalc.usps.gov/default.aspx?Mode=Intl_Single&CID=10054 Share your shop WORLDWIDE! Do you have any tips to help grow an Etsy shop? Would love to hear them. Every little bit helps. 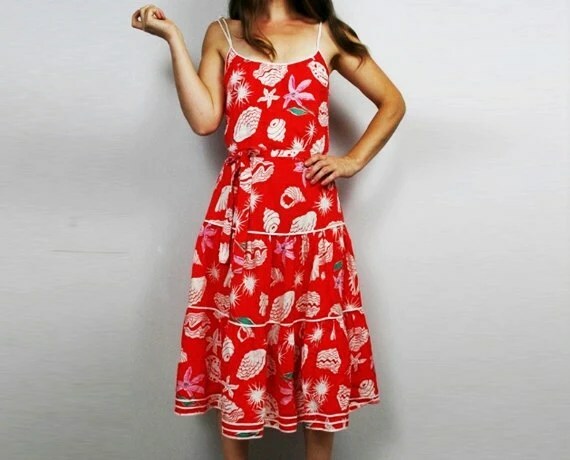 Yesterday I thanked the designer, today I must give a nod to my true love: affordable, adorable, one-of-a-kind vintage dress, all available at Frequency Vintage! 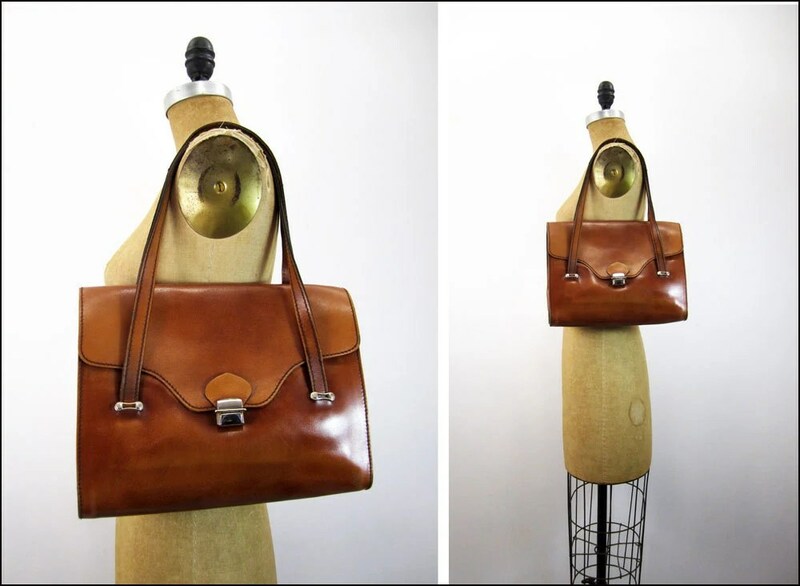 My online vintage shop Frequency Vintage has been up and running 3 weeks now and going well. Since it is a side project things tend to go a little slower than I would like. My impatience kicks in and I want more views and sales NOW!!! But how? What are the best ways to bump your Etsy shop to the top of everyones favorites? 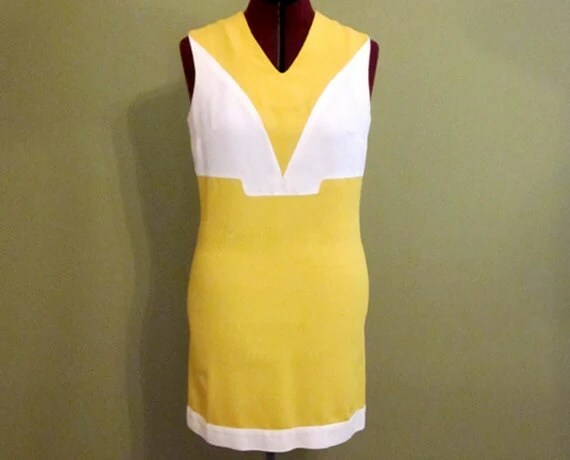 Gonna drop a little vintage shopping tool on you: Vintage Fashion Guild is a great resource for finding out more about vintage designers and labels. 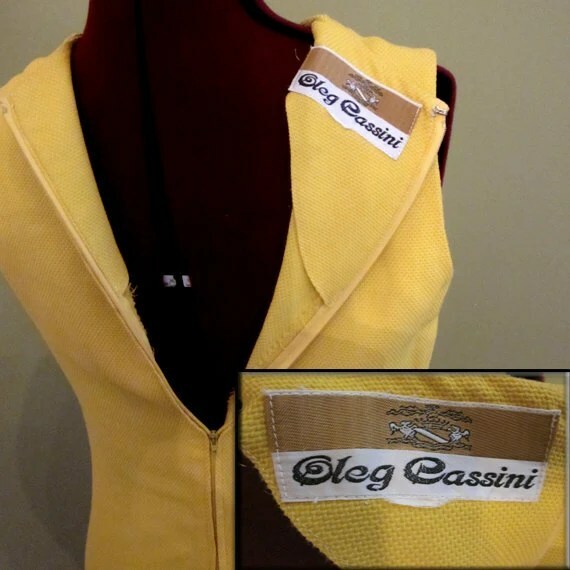 I found this Oleg Cassini dress and used the Vintage Fashion Guild to check the label for dating the piece and to learn more about Cassini. 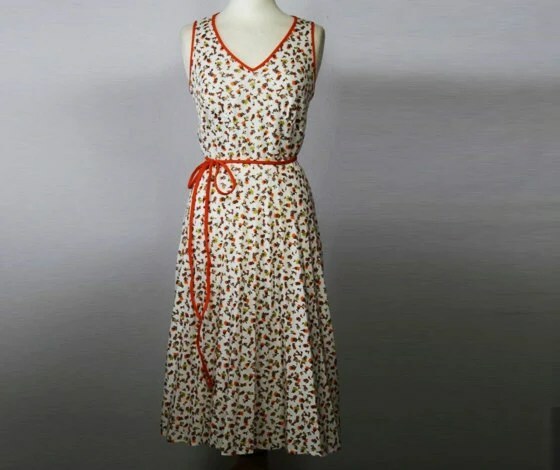 Really love the dress and liked matching the labels for 1970s authentication. Anyone have any other vintage label/designer resources? 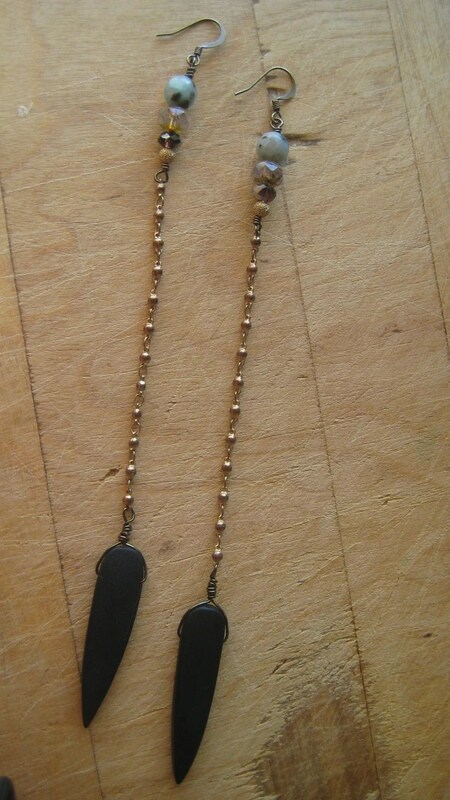 Coming soon to Frequency and a Great Etsy tool! 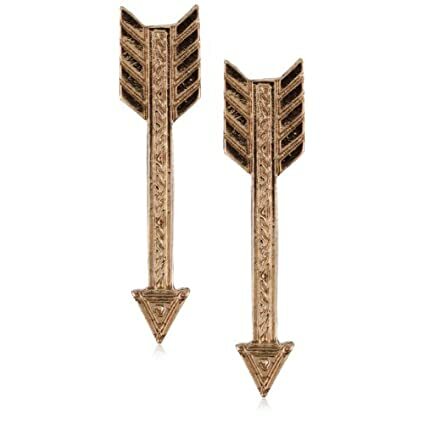 Alright, really loving the shopping that comes along with open an online store. 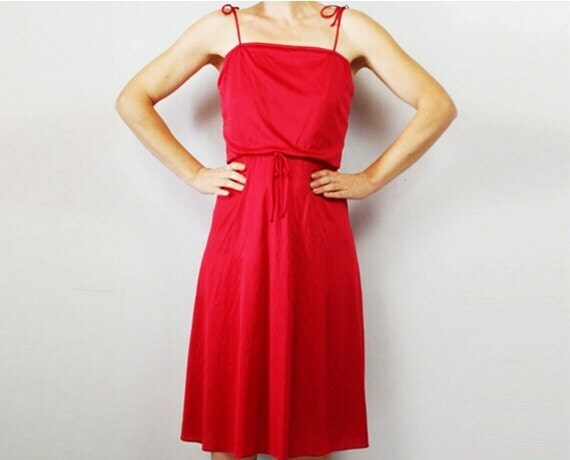 Just want to share a recent buy that will be in Frequency Vintage soon, if it doesn’t end up in my closet first! 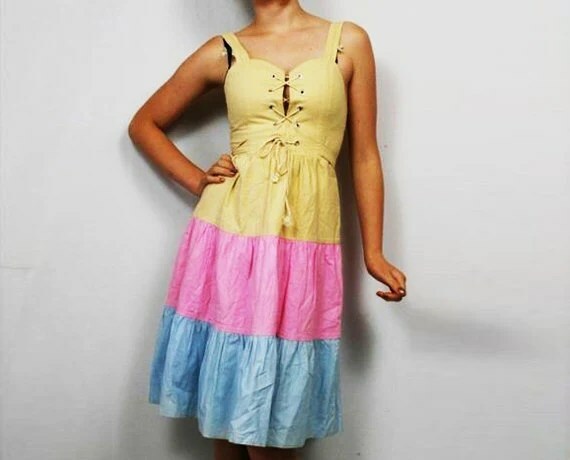 I love dresses like this, perfect in fall with a sweater, winter with tight, boots and a cropped jacket, spring layered on top of a long sleeve tee with knee highs and oxfords, or summer with sandals. 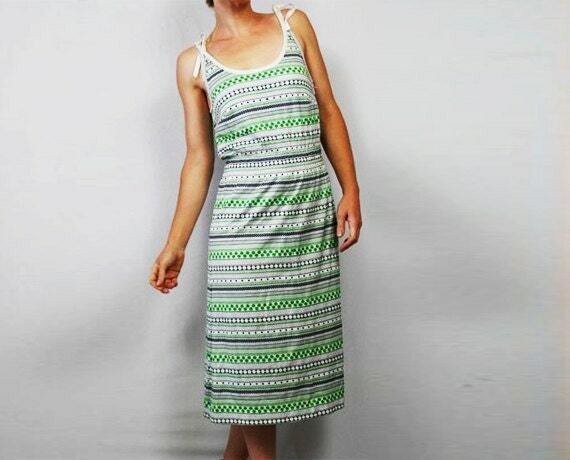 Cute pattern, diverse styling options and so comfortable. I found this in a french vintage shop, so may take about two weeks to land into Frequency, but it’s always nice to have something to look forward too! OH, and I also wanted to share an amazing tool I found. The Etsy/PayPal fee calculator. A great help in inventory pricing. Check it out! Been using this tool to price out my inventory. Looking forward to posting more tonight. Will let you know tomorrow what’s new in the shop!